It's interesting to see how new printings appear as they imply that the forecast usage (original print quantity) was wrong or under-supplied, necessitating a new printing. My thanks to a couple of correspondents for alerting me to the arrival of the 20p MA13 printing in my absence, and to Richard P for providing the images. These should be in stock by next week. These are from the early De La Rue 2013 printings with no printing date nor sheet number. 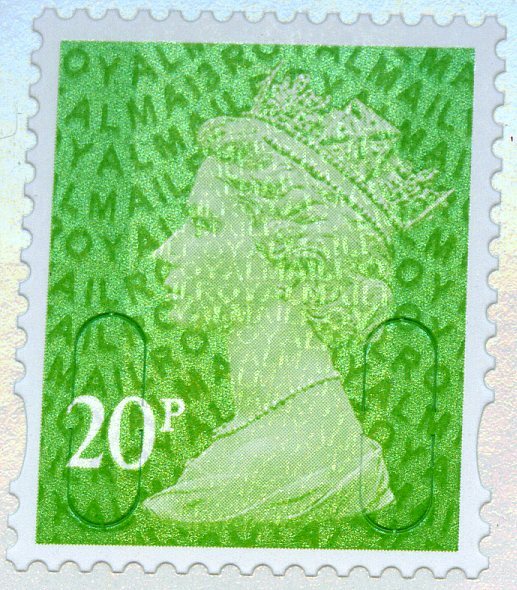 As with the original printings the colour cylinder is D2. The iridescent cylinder is again D1 - a different D1 to that used before, of course. So when comparing cylinder blocks, collectors (and dealers!) 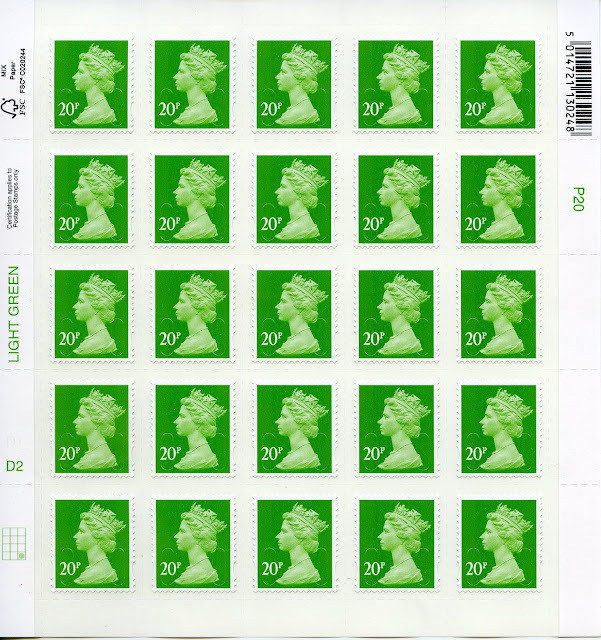 need to look carefully at the stamp as there will be several different D1 D1 D2 blocks. Until the self-adhesive Machins became available, I have collected cylinder blocks of six or eight. What are being collected now? Cylinder blocks; date blocks; or right hand blocks without serial numbers or dates? Is there any way of knowing if the right hand margin is "empty" if you only collect cylinder blocks? I think most people collect CBs of 6, although many still do a diagonal cut in the margin (which seems kind of silly as the margin is perforated/rouletted through). Some collect larger blocks including the colour name. Now that the cylinder number has moved do row 4, a CB of 4 would do, 6 takes in the name. If you want just cylinder blocks then that's what you collect. If you want date blocks (usually of 8) then there will be many more to collect. Last question: not if the same cylinder combinations exist with or without printing date and sheet number. Only time will tell whether this doesn't occur for any values. The 78p is believed to exist with and without although we have only seen the dated sheets. Got singles in your shop yet - can't see them? !